As preppers and survivalists, we know that we can’t take our entire gun or knife collection with us if the worst happens. So while highly-specialized knives are great to have for their intended purposes, a good, versatile survival knife that can take a licking and keep on ticking is something we should all own. For many outdoor enthusiasts, the Fallkniven A1 is that knife. A world-class fixed-handle knife with some amazing innovations, the Fallkniven has earned the praise of outdoorsmen everywhere. Still, is it the knife that’s going to make a difference when everything is on the line? Only a detailed analysis will tell. Keep reading for our full Fallkniven A1 review. Unless you are one of the unlucky few to get a lemon or a counterfeit, this is a super-reliable heavy duty survival blade that should serve you well for years. Many users claim the blade “exudes quality” and feels great in your hand. The circumference of the handle too small for some. No effect from water, perfect for use in hot or cold weather. Quite pricey, even for a premium blade. Kraton handle is very grippy, even in wet weather. Great balance and finish – matches the heft of the blade perfectly. The term “all-purpose” tends to imply that something is OK at a lot of things, but excels at nothing. The people at Fallkniven – a Swedish manufacturer that produces highly-regarded, quality blades – attempted to destroy this stereotype forever with the A1. But before we get to the knife’s specific features, we need to identify the standards by which we’ll be judging this knife, its features, and its capabilities. After all, there are many things to consider when buying a knife, and depending on who you are, where you live, and what kind of performance you expect from your knife, you might have a completely different set of needs than another reader. Blade Size – Where small blades offer better concealment, and thin blades offer precision, heavy, thick blades provide more versatility, allowing you to chop, baton, and pry as well as cut. Geography – If things go downhill fast, where will you be? Your location will have a dramatic effect on what roles you’ll need a survival knife to fill. For instance: areas with long winters require blades that stand up to moisture and resist rust, while desert locations might not have to worry about excess moisture as much. Blade Metal – Once you really get into researching steel, it quickly becomes clear that there are hundreds of blends and types, and each one has its own PROs and CONs to consider. This means each blade will need to be evaluated on its potential to suit your needs. EDC or Not – If you’re tramping around the woods for hours at a time, you might not have an issue with a big, bulky blade – as you’ll probably need it at some point. For EDC in a city, however, blades like this draw a lot of attention, and can cause more problems than they solve. Weight – Heavy knives provide the chopping power necessary to deal with tree limbs and other hard-to-cut items you might encounter in a survival situation. On the other hand, lighter knives offer finesse, allowing you to make tools, whittle, and do other more precise tasks. 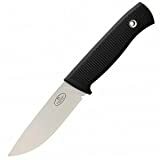 Accessories – Knife manufacturers have gotten in the habit of offering lots of “extras” and accessories with their blades. Most offer sheaths, while others include sharpening stones, compasses, and other “survival-related” products. This can sweeten the deal for a lot of customers. As far as how the Fallkniven A1 aligns with the above considerations, the blade is laminated VG10 steel that measures 6.2” and boasts a thickness of .23”. The laminated coating is 420J, and some models have an additional black satin finish overtop this. Overall, the length is (280 mm). The manufacturer claims this knife was designed as an “all-purpose” companion blade, and is suited to heavy tasks like chopping thanks to the full-tang blade, but also suitable for finer tasks thanks to the ergonomic Kraton handle. From first impressions, it seems like the Fallkniven A1 would be well-suited to survival situations as well as everyday carry – just not in the city. It’s big and heavy, but promises to have a little bit of a “soft side” as well. Let’s see if that holds true. The blade of the Fallkniven A1 is the real “star of the show” when it comes to this knife. Heavy, versatile, and made of ultra-tough steel, the 6.2” of cutting surface should chop, slice, hack, and pierce just about anything you need it to. Most users claim that they’ve put the Fallkniven through the wringer on several occasions, and give it stellar reviews. The real testament to the craftsmanship over at Fallkniven is the lack of significant complaints about this blade at all – especially unusual for a knife with a convex edge. Aside from a few issues with models that were clearly defects, the worst complaints seem to mention some light chipping, though there’s no way to confirm if “user error” played a part. If you’re going for an “all-purpose survival blade,” a drop point design makes the most sense. In the case of the Fallkniven A1, this drop point is further supported by a nice sweeping belly, similar to a ship’s prow. This will make it an excellent chopper, functioning similarly to a machete. The piercing ability is backed up by a nice swedge at the forefront of the knife, which should be enough to prevent cracks and bends at the tip. The blade is relatively thick as well, nearly a quarter of an inch. This should make bending, let alone cracking the blade, almost impossible. The edge is partially flat ground, but ends in a convex ground edge, resulting in fantastic cutting performance. If you want to baton wood or hack through forests, this shouldn’t disappoint you. For those not familiar with laminated steel, it is a process by which a blade is made out of layers of steel rather than one single type. In the case of the Fallkniven A1, the core is VG10, which has a reputation for hardness and can sometimes be dismissed as brittle. The outer layer of the blade is 420J, which is known for being highly-corrosion resistant, have good strength, and be quite resistant to impact. In general, one can assume that the A1’s cutting ability lies in the VG10, while the chopping ability comes from the 420J. The most important feature regarding the A1’s capabilities as a survival knife, however, is the water and weather-proofing. According to the manufacturer, no amount of water exposure, heat, or cold can have any effect on this knife. What more could a survivalist ask for? The A1 boasts a 4.8” handle that Fallkniven claims is designed with natural ergonomics in mind. Made of Kraton, a rubber-like polymer praised for its overall toughness, it features some nice deep grip patterns to keep both hands and gloves where they belong. This is backed up by a nice large finger guard. The pommel features an exposed end of the full-tang steel, which can pound or crush pretty well. There’s also a generous lanyard hole near the end of the handle if you want a way to “full proof” your grip. According to most users, the handle is comfortable and provides an excellent, reliable grip for people of all hand sizes. The Kraton should do a great job of absorbing the energy from any heavy chopping, keeping the user from tiring, and the grip is tacky enough to keep the blade in the wettest hand. The only significant complaint about the handle seems to be that the circumference isn’t thick enough to match the general heft of the knife. Finding a sheath that pleases all customers must be the bane of every knife manufacturer’s existence. In the face of so many complaints, you can barely blame them for saving a few bucks and just going with the most general sheath they can. That being said, I have to give Fallkniven credit for choosing the Zytel polymer sheath they’ve included with the A1. It’s simple and straightforward, yes, but easy to clean, versatile in all temperatures, and snaps the blade in place quite securely. With the blade snapped into place, you can comfortably attach it to your pack without worrying about it falling off while you’re trekking. While this is all well and good, many users would like to see a few more snap enclosures with the sheath to ensure it doesn’t get away from them, as well as a “quick release” option. Again, this is – at the end of the day – an included sheath. While it’s the worst part of the knife overall, it really only seems that way because of the quality (and price) of the rest of the product. It would seem that a closer look at the Fallkniven A1 only reveals more aspects of the knife’s quality, and therefore its reliability as a survival blade. The manufacturer has an excellent reputation for producing quality knives, the blade components make sense for this type of knife and are backed up by sound science. Moreover, the design of the knife from hilt to tip suggests an attention to detail and a purpose in design rarely seen at this price point. The knife has caught the eye of collectors as well as survivalist for its rugged beauty and dynamic blade shape. Not as forward-heavy as other knives of this type. This allows the blade design to do the chopping, not just the weight and force. By almost all accounts, this knife comes razor sharp out of the box, ready to hit the woods or the backyard the second it arrives. There are alternatives to the Fallkniven A1 if you want to check out other options. Here is a look at some of the best ones. If price or size is the main point of hesitation with the A1, the F1 might be the answer. At only 8.25” overall, and boasting a 3.75” blade made out of similar laminate VG10 stainless steel, the F1 is a great substitute for its “older brother” at about half the price. In case you doubt the knife’s capabilities, this “military survival knife” is carried uniformly by the Swedish National Defense Forces. It stands out against the A1 mainly because of size and chopping ability, though the F1 is still great at processing wood thanks to its convex grind. Full-tang, drop point, and well-balanced, this is a great blade to have with you in a tight spot. And unlike the A1, it’s almost entirely concealable. Laminate VG10 stainless steel blade. Carried by the Swedish National Defense. 3.75” drop point blade with satin finish and convex grind. Full-tang design goes through a Thermorun elastomer handle for a reliable grip. The ESEE ES6PB-BRK 6 is a mouthful in terms of its name, but you don’t have to pronounce it to to get some great use out of it. At 11.75” overall and boasting a 5.75”, black powder coated blade, this is certainly not the kind of tool to let you down in a pinch. The blade is made of 1095 carbon steel and boasts a sizable choil, thumb jimping, and a full tang that goes straight into a rounded pommel. In many ways, the design of the ESEE mimics that of the Fallkniven A1, especially in the shape of the drop point, fat-bellied blade. The manufacturer bills this knife as a “wilderness tool,” a term which certainly lends itself to versatility. But, while the 1095 will take and keep a great edge, it could also be prone to rust once that power coat is knocked off. Providing you don’t mind oiling your blade now and then, it’s still an excellent choice for any survival situation. The sheath has a lanyard, cord lock, and boot clip. Also secures knife upside down. Designed as a “wilderness tool” – able to handle many jobs well. KA-BAR is a trusted name in knives (most people know them from the standard issues knives carried by US Marines), and Ethan Becker (the designer of the BKR7) is a trusted name in survivalists. Put these two together, and you have a recipe for a knife that can rival the Fallkniven A1 at a fraction of the price. While the BKR7 lacks a lot of the attributes and the polished design features that make the A1 so great, it has some great elements, like thumb jimping, a Zytel handle, and an extended full-tang design. However, while the 1095 Cro-Van steel will hold a great blade, you will struggle with rust if you don’t take the time to oil it. 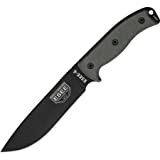 Still, with a 7” blade, and coming in at 12.6” overall, it’s impressive that the knife only weighs 12 oz., which makes it well suited to long hikes through the woods. Sturdy and lightweight design despite the large size. Zytel handle made of durable glass-fiber filled nylon. 12.6” overall with a 7” drop point blade. At this point, it should be clear that the Fallkniven A1 is an exceptional knife, and will more than likely stand up to almost anything it could encounter in the woods, city, or ocean. If you’re a survivalist who needs a trusty, reliable knife that you can assign to any task, and your budget can handle it, the Fallkniven is a wonderful investment. For more details on the Fallkniven A1, click the link below.